A newly surfaced Apple patent shows that the tech giant is working on solving the problem of that weird booming, echoey effect you get when talking while wearing noise-cancelling earbuds. Technically called occlusion effect, it's created (in part) by the sound of your voice getting trapped in your ear canal. As your voice resonates through the bones of your skull, the earbud blocks your ear canal’s exit, turning it into a small echo chamber. Apple looks to be working on a novel approach for solving this that uses a valve system to allow sound to travel out of your ear canal, hopefully mitigating the effect. The patent, discovered by AppleInsider, references the fact that there are two different types of insertable earbuds: those that block the ear canal, and those that don’t. While the ones that don’t (referred to in the patent as ‘leaky insertable in-ear speakers’ which doesn’t sound like something we’d want in our ear) don’t create occlusion effects, they also allow ambient sound in, potentially disrupting the user’s audio experience. Of course, having no ambient sound is also a negative thing, as it would affect user safety and ability to communicate while wearing the earbuds. This is where the second part of the patent comes is, which is where a microphone would allow the user to hear the sounds of the ambient surroundings when they need to, but it looks like both the microphone and the valve can be deactivated when not needed. What’s more, the sound that comes in from the external microphone looks like it's going to be tailored to the ear canal of the user. 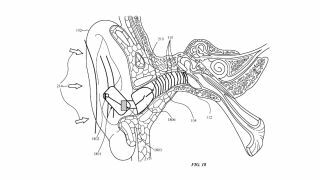 The patent states: “the ambient content audio signal is digitally processed in accordance with an equalization profile being a plurality of acoustic characteristics associated with the ear canal”. What this should mean is that the digitally processed ambient sound feels more natural in your ear, and can be played at the same time as your content, so you can go for a run with your earbuds in, have good sound quality, and not have to worry about missing the sounds of hazards. Of course, as this is just a patent there’s no guarantee that this technology will ever see the light of day, but as we learn more we’ll let you know.